Ho Ho Ho-ooooly crap that smells so frickin' good! I'm taking a break from all my restaurant posts and showing you how we Zamora's roll during the holidays. Like I said before.. Boy, can we eat! I gained around 10 pounds this holiday season. Even though I promised myself I wouldn't, I still did. As you can imagine, holidays with my family always involves a huge feast, and my mom takes her Noche Buena very seriously. When it comes to hosting an event with the family, my mom has no idea how to keep things "small". But for someone with my appetite, that works out just fine. As I mentioned in my previous "Home Cooking" post, my sister Rose is an internationally trained chef, so we are always eagerly awaiting what dishes she'll be whipping out on Christmas Eve. Rose and my mom joined forces to great their version of a Christmas miracle. My mom made some breaded Sea Bass with Aioli Sauce, just to get us started.. It was delicious! She usually uses Cream Dory, but this time she switched it up and used Sea Bass instead. To be honest, I wouldn't have been able to tell the difference at first bite, because they were both basically white fish, and I was so hungry (My mom only allows us to eat at 10pm due to Noche Buena protocol) that I could have been eating breaded rubber erasers and not have noticed. Crispy on the outside, yet soft on the inside. The Aioli sauce gives it an added garlicky kick to it. My sister makes restaurant quality lasagna. She uses a blend of Mozzarella cheese, and Australian Cheddar, to make this masterpiece. "Too bad I can't eat too much of it because of my hyper acidity", Said The Pickiest Eater In The World, as a single tear rolled down his cheek. 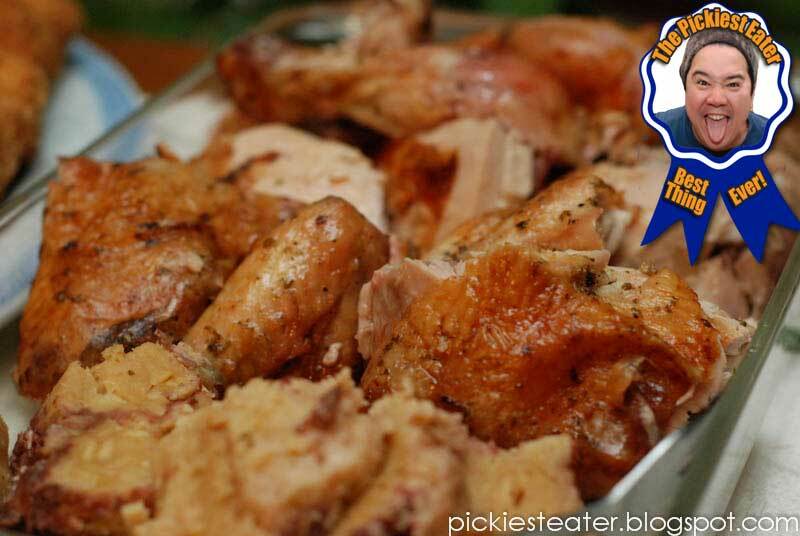 My Mom's recipe for Roasted Chicken with Bread stuffing is one of my favorite dishes of all time. 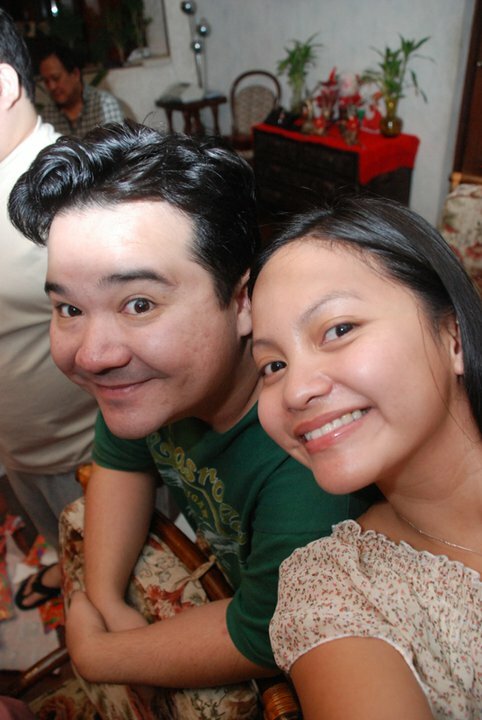 When I was in High School, we were living in Cebu, and my mom flew to Manila for a few days. My mom told me to coordinate with my brother for our dinner menu. I asked my brother what he wanted for the week, and he said "It's up to you." I had our cook make this dish for me and my brother for three days straight. By the third day, my brother couldn't take it anymore and threw a fit, preferring to frying up some Spam instead. I didn't care though. Even to this very day, I love this dish. The bread stuffing, especially when dipped in the gravy made from it's own drippings, is excellent! This bad boy was undoubtedly the star of the Noche Buena feast. My sister roasted a leg of lamb basted in variety herbs. I know what you want to ask, and the answer is, "YES, it tasted as wonderful as it looks." The meat was so juicy and tender, and the flavor of the oregano just burst into your mouth with every bite.There was a decent ratio from fat-to-meat, but naturally, i'd prefer it to be fattier. Also, the roasted veggies on the side, particularly the onions and the potatoes were amazing! My brother usually prepares dessert for our family events, but he was so exhausted from the Oz Cake orders we had this Christmas we had to buy from another supplier. We decided to go with Dulcelin and their Strawberry Shortcake. Though it was an excellent strawberry shortcake, It's still a notch below the highly acclaimed Yulo Strawberry Shortcake. Disclaimer: My brother forgot to take it out of the freezer, so the strawberry icing kinda iced up a bit. Unlike the Yulo cake, the top has a strawberry jam layer, melded beautifully with whipped cream. The cake is a moist chiffon, whose buttery goodness goes perfectly with the sweetness of the strawberry. Dulcelin is famous for their Mango Torte, so we couldn't possibly let the holiday season pass by without picking up one of these. As much as I wanted to devour the whole thing, I was worried about my hyper acidity acting up, so I took a few spoonfuls, and that was that. But believe you me, it took every ounce of strength I had not to go back for more. The base is made of nougat, and the mangoes and cream were so good, this dessert should be made illegal. 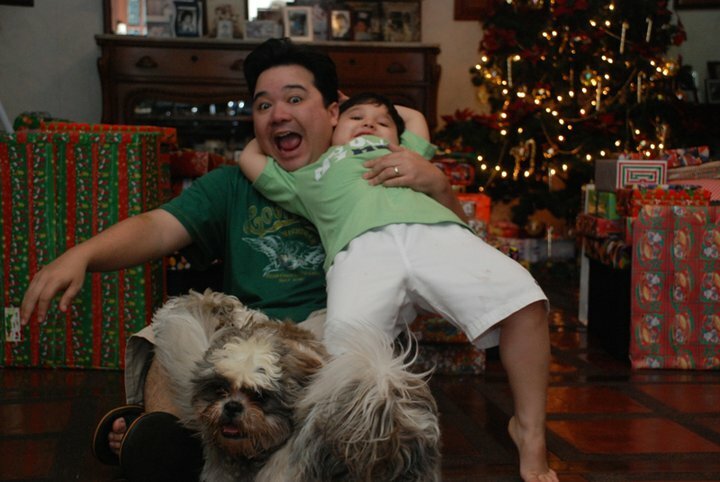 Me and Gael, goofing around with Schatzi and his brother Spike. That went perfectly with a cup of steaming hot chocolate. My mom and Rina share a fondness for Fiesta Ham. Actually so do I. My yaya makes this wonderful pineapple glaze sauce for it, that makes it even more awesome. My mom ended what was supposed to be a light "Brunch" with a large pan of Paella. I asked her, "Mom, I thought you were gonna keep things small for brunch?" She answered, "What? I used the smaller pan, didn't I?". What can I say? Mothers are always right! Just cousins overseas? Oh God, Tito. This almost killed me. wow, that just got my stomach growling like crazy! awesome, awesome way to celebrate! Sorry about that boom... hehe.. we missed you dearly! Haha like I said bro.. we're not accepting adoption applications at the moment!